This class is for drivers from age 6 to end of Year of 9th birthday. 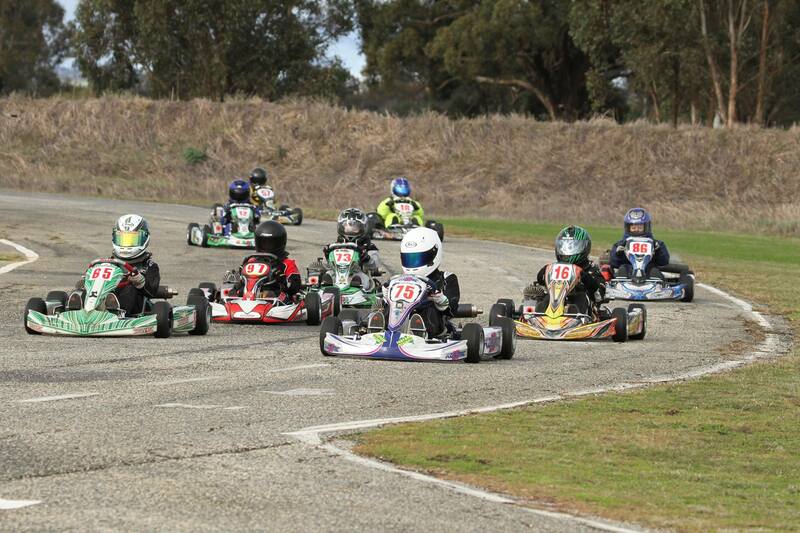 The purpose of this class is to teach young people to drive karts of restricted performance at a limited cost. Competitors can use a Vortex 60cc Mini Rok fitted with a 16mm restrictor plate,Yamaha KT100J fitted with a 13.02mm restrictor plate or Comer SW80. Drivers aged between 6 and 7 are only able to practice at club level only and must be 7 years of age before starting racing. Chassis eligibility states a minimum wheelbase of 880mm. More common chassis used is a 900mm, newer chassis have wheelbase adjusters that will allow you to change the wheel base out to 940mm.The chassis should be manufactured from 28mm tube which suits lighter weight karts and drivers. The Cadets use a 30mm hollow rear axle that is designed for use with drivers in the 6-12 age group. There are many manufacturers of these ‘Cadet Karts’, you can choose from Arrow, Deadly, Monaco, CRG, Tony Kart, Kosmic, Ricciardo and many more. We suggest you look for a brand that is commonly raced in the Griffith Kart Club, this will ensure availability of spare parts and advice from other experienced club members. The class can use The Yamaha KT100J engine fitted with a restrictor Even though this class can use the Yamaha KT100J or Comer SW80 engines, it is a good idea to consider the Vortex Mini-Rok. We have seen this engine on-track racing both the Comer and KT100J and the Mini-Rok is significantly faster and will provide the driver with a competitive engine. The Vortex Mini Rok engine is able to be used in both Cadet 9 and Cadet 12 Classes with minimal cost and minor changes.